The following is an observation of Caribbean seagrass species found near South Water Caye, Belize, as well as an observation of the species that make their home in the seagrass beds. The results from the observation are compared to similar studies done previously, one gauging the health of seagrass beds and the other a census of species found in the seagrass environment. Sources on Caribbean seagrass state that the most common species of seagrasses found are turtle grass (Thalassia testudinum), manatee grass (Syringodium filiforme), star grass (Halophila engelmannii) and shoal weed (Halodule beaudettei or Halodule wrightii) (Seagrass). The purpose of this research was to gather information on the species of seagrasses found around South Water Caye, Belize, and information on the species of plants and animals that live in or around the seagrasses. 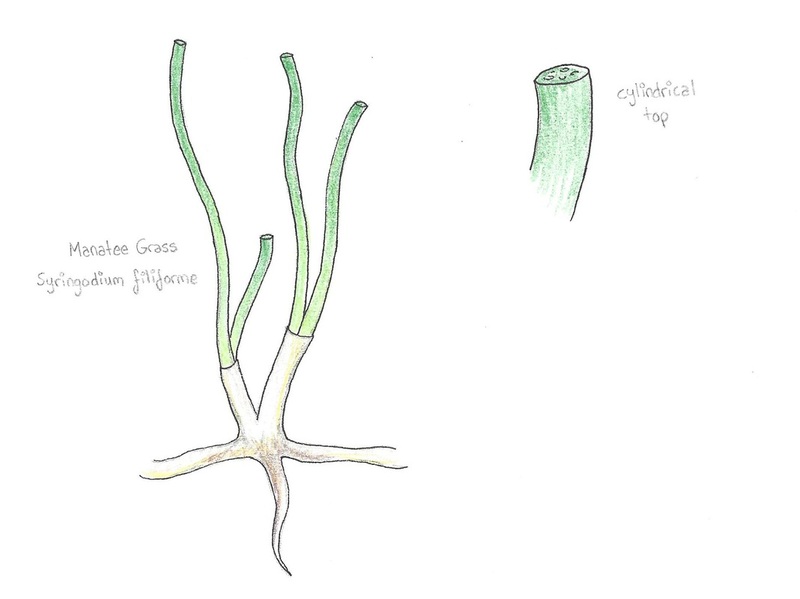 The objective was to sketch and describe the seagrasses and the species that were found in them to get an overview of the diversity found in the water. The hypothesis of this research project was that turtle grass (Thalassia testudinum) and shoal weed (Halodule beaudettei or Halodule wrightii) would be the most prevalent of the species found. The species found in the grasses would vary from area to area, but the majority of the observed species would be juvenile fishes. The materials used to conduct this research included the preliminary research to compare the fieldwork to, and equipment used to take notes and diagrams: paper, pencils and an underwater writing tablet. 1. Conduct preliminary research before departure. Collect as much relevant information as possible to compare findings to. 2. In Belize, begin observing the seagrasses, both from afar, and up close. Observations will be done underwater, using snorkel equipment. 3. 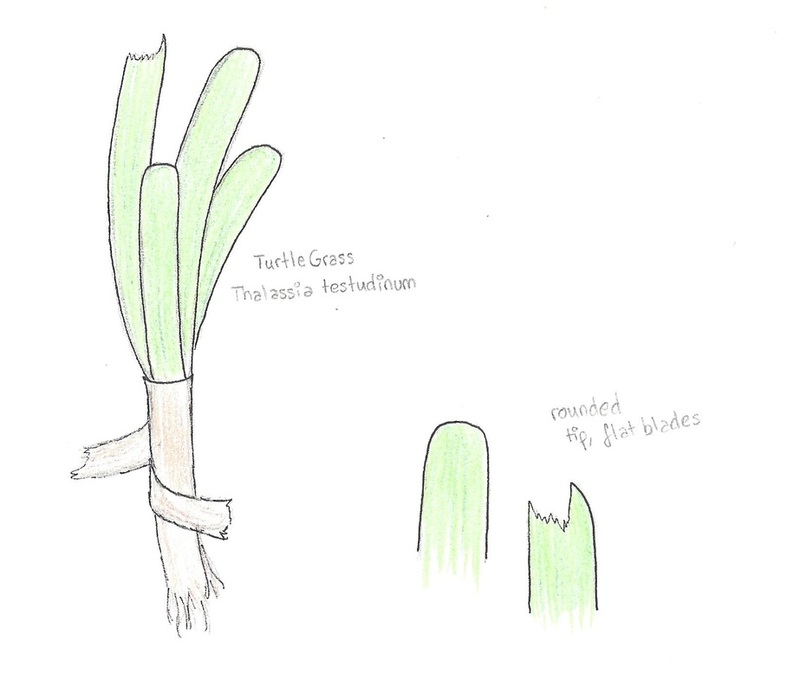 Make sketches and observations about the seagrasses and organisms found on/in them. 4. Compare findings to research, and make hypotheses about differences in conclusions. The results collected showed that turtle grass and manatee grass were the most abundant species of seagrasses, while shoal weed and star grass did not grow in the area studied. Turtle grass was the most abundant, growing in large underwater meadows. Manatee grass occurred in the same areas as the turtle grass, but there was significantly less of it. 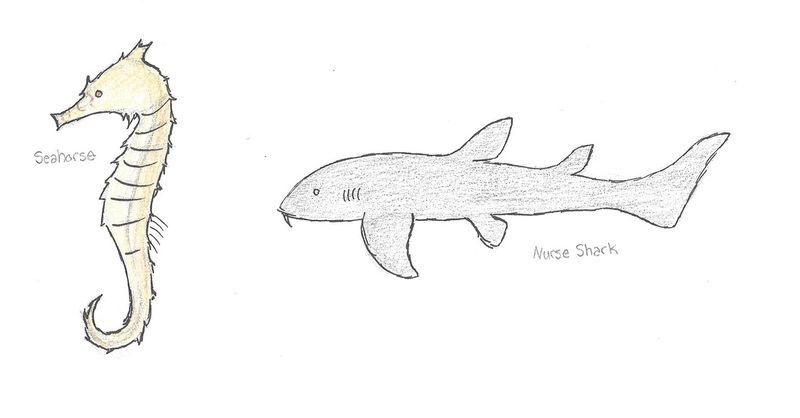 Species observed in the seagrass beds included seahorses, starfish and a nurse shark. The seagrasses were also covered in a brown film— the algae and epiphytes that live on the seagrasses. Most of the seagrass leaves, of the turtle grass in particular, had been eaten by various species of fish, both juvenile and adult. Another study of Caribbean seagrass, 30 miles southwest of South Water Caye, in Placencia, Belize, reported similar results. The study, published in 2006, reports that “the seagrass species present are mixed stands of Syringodium filiforme [manatee grass] and Thalassia testudinum [turtle grass], to pure stands of T. testudinum at the deep edge. Some Halodule wrightii [shoal weed] is found scattered within the meadow” (Short et al.). While it’s possible that shoal weed might be more plentiful 30 miles south of the main testing area, it’s very improbable that the amount would suddenly increase over that short of a distance. It’s also possible that, while shoal weed wasn’t observed during the snorkels, it was actually present, and mistaken for manatee grass from a distance. It was also explained as basic knowledge to our group that the only species of seagrass present around South Water Caye were T. testudinum and S. filiforme. Another study, this one published in 1993, concentrates on the species found within the seagrasses. The researchers reported that Bluestriped Grunt (Haemulon sciurus), French Grunt (Haemulon flavolineatum) and White Grunt (Haemulon plumieri) were the most abundant species when the seagrass beds were trawled. “Bluestriped grunt ranked first in overall abundance and weight, and dominated in number in mangrove and seagrass habitats. Catches in the seagrass beds were 7.1 individuals per trawl” (Sedberry et al.). Not enough time was spent in the seagrass beds to observe all the species that made their home there-- only two or three were actually observed. The previous study concentrated mainly on fish species found in seagrass, and made notes that most individuals found in the trawls were juvenile. The seagrass species found near South Water Caye were Thalassia testudinum (turtle grass) and Syringodium filiforme (manatee grass). There was significantly more turtle grass than manatee grass in the meadows that were observed. It’s possible that turtle grass grows at a faster rate than the manatee grass, and has an advantage when photosynthesizing. The hypothesis was not entirely supported, as it was expected that all species of seagrass would be present, and that turtle grass and shoal weed would be the most prevalent. The results showed that only turtle grass and manatee grass were present, and the turtle grass was significantly more prevalent than the manatee grass.